Escape From The "Red Paradise"
A Journey Of Thousands Of Miles From Communist Slavery To Freedom. This story is only a summary of my family history, which is being compiled in a book which will be illustrated with photos, certificates drawings and maps. As early as in 1763 the Russian Czarina Catherine II (the Great), of German origin, tried to attract German people to populate and develop the vast Russian empire, with several incentives. Later czars also tried to attract settlers; but they did not offer them the same incentives. However, the country was still attractive because of the vastness of unpopulated lands. The Neumann family, which lived in Prussia, decided to follow in the footsteps of many others that migrated in the czar's time to Volhynia, looking for better living conditions. When the communists took over the country, the people's dreams were transformed into a nightmare. With great difficulty and sacrifice, the Neumann family escaped to Harbin, China, where they started to live their lives as refugees, and later emigrated to Brazil. Currently, most of Volhynia belongs to Ukraine; a lesser part belongs to Belarus. My great-grandparents, Gottlieb Neumann and Juliane Janke were married in the parish of Zhitomir, Volhynia, on 17 February 1859. - Johann, born 6 April 1869 in Nedbajuwka. - Justine, born 10 February 1871 in Nedbajuwka. - Ludwig, born 27 January 1873 in Alexanderdorf. - Gottlieb, born 15 June 1875 in Alexanderdorf; died three days later. - Gustav (my grandfather), born 19 January 1880 in Alexanderdorf. - one stillborn, unnamed, 18 April 1883 in Alexandzerddorf. - Mathilde, birth date unknown; died 19 October 1883, age five. My grandmother Rosalie Michailovna Stripling was born in Alexanderdorf, Volhynia, 8 February 1883. Alexanderdorf, whose name was changed to Granidub in 1893, was located approximately 150 miles west of Kiev. Nebajufka (or Nedbajuvka) was 2.5 miles from Granidub, all in Heimtal (Home Valley) in Volhynia. The marriage of my grandparents Gustav Neumann and Rosalie Michailowna Stripling was in Rudnha, Volhynia, 15 January 1903. They had purchased a farm in Granidub, and they lived there, working as farmers. In Granidub (formerly Alexanderdorf) their children were born: Herta 7 December 1903, Erna 25 August 1906 and Ewald 20 July 1909. The times of the family in these years was of prosperity. Improvements on the property had been made; more machines to help in planting and harvesting had been added; and the house had also been embellished. Gustav Neumann traveled to learn about South America. He was gone approximately three years from 1911 to 1913, leaving pregnant Rosalie at home, with small children, to manage everything, and yet to send money to him. Among the countries that he visited were Argentina and Brazil. His son Herbert was born 20 December 1911 while Gustav was traveling. Deportation during the First World War. The First World War broke out in 1914. Although 300,000 Germans served in the Russian army, there was a general anti-German propaganda campaign throughout Russia. Speaking German in public was forbidden. Discrimination against German people reached such a point in July 1915 that deportation orders came for removal of Germans from Volhynia. The policy arrived with soldiers armed with rifles and bayonets. Farmers were forced to abandon their farms, livestock and everything. Gustav and his family were banished to the area between the Volga River and the Ural Mountains, where Siberia begins. It was time for the harvest but everything had to be abandoned as it was. Two horses were hitched to a wagon; a canvas was fastened on as a covering. Provisions and warm clothes were loaded on. With their small children loaded in the wagon, they left behind, the house with all the furnishings, plantings and other belongings. Now without their farm and house, they made the wagon their home. After they had traveled a stretch, they would stop for a time to work on farms to get money or food and then continue on the trip again. They endured many hardships and difficulties to survive. Cold, hunger and disease decimated thousands of Germans during this deportation. Aus Wolhynien sind gezogen, die Verjagten arm und reich. Keinem ging der Weg auf Rosen, alle waren sie jetzt gleich. Muessten durch die Truebsalsschule, alle arm und reiche Leut. Angespannt und schwer beladen, stand der Wagen vor der Tuer. Manche Sachen, oh wie Schade, bleiben liegen, nichts dafuer. Es ging fort auf Pferd und Wagen, nach Befehl der Obrigkeit. Niemand fand dort einen Retter, der ihm aus der Not befreit. So ging's fort durch Sturm und Wetter, bis es zu dem Bahnhof kam. Und dort haben wir gewartet, auf den Zug der Eisenbahn. Endlich war es aufgeladen, und die Menschheit fuhr dahin. Und der Weg mit schnellen Schritten, fuhrt uns nach Sibirien hin. Jeder lenkt' den Blick nach oben, ach, wann werden wir befreit? Und zu diesen Truebsalkeiten, kam der Tod mit Riesenschritt. Kleine Kinder, alte Leute, junge Blueten nahm' er mit. No one went the way of roses; all were now equal. All rich and poor people would have to endure the school of affliction. Hitched and heavily laden, the wagon was at the front door. They left on horse and wagon, forced by the authorities. No one found a savior; who rescued them from their misery. We traveled forth through storm and bad weather; until we came to the train station. And there we waited, for the arrival of the train. And the route led with quick steps to distant Siberia. Everyone links the view to beyond; oh, when will we be set free? And to this great trouble, came death with giant steps. It afflicted small children, old folks and young people. In March 1917, the revolution that was known as the February Revolution (the Russians still used the Julian calendar), compelled Czar Nicholas II to resign. A provisional government was established. In the schools of the German colonies, the use of the German language was again allowed. With euphoria, the socialist parties launched an intense propaganda campaign among the masses, promising great miracles and heaven for the people. The Bolsheviks had planned a coup d'etat to take power by force and to establish communism in the country. They were successful in doing this on 7 November 1917. This coup d'etat was known as the October Revolution. They had attacked the strategic points in Petrograd (old Petersburg) and had overthrown the provisional government. The country was now in the hands of Lenin. The government authorized the looting of the country in the name of socialism. The poor peasants had been organized and controlled by Bolshevik agitators into groups of "without land". Through slogans, the leaders encouraged the masses to attack the bourgeois class members and to take from them whatever they wanted. Many of the common peasants wanted to participate in this plundering. Anarchy was rampant in the country. People who were disappointed and dissatisfied with the radicalism of the Bolsheviks, started to organize centers of resistance in some parts of the country. An army of volunteers was created and was called the "White Army." They were poorly armed but highly motivated to defeat the Communists. The government, in turn, created the "Red Army", armed with weapons seized from the Czarist army. A bloody civil war ensued, which lasted until the end of 1920. While democratic processes developed in Europe and America, autocratic processes of the most violent kind in the history of humanity, developed in Russia. No opposing thought to the communist doctrine was tolerated. Expression of free thought or personal freedom was finished. In December 1917 Russia signed an armistice with Germany. Families which had survived the exile during the civil war, received authorization in the beginning of 1918 to return to Volhynia. They found the majority of their proprieties occupied by invaders, who generally caused great devastation. Farms, cattle, tools, furniture, equipment and everything that they were forced to leave behind was stolen or broken. Those who had had their property seized by the "Muzhik" (peasants) had not been able to get it back. The "Muzhik' refused to leave. Gustav and his family had obtained authority to reclaim their half destroyed property. They worked hard to rebuild the house and granary. They re-organized everything and prepared to plant. It was difficult to begin again, because of the high prices. A cow that had cost 50 roubles in 1914 now cost 15 times as much in 1918. On 14 February 1918, the Julian calendar was replaced by the Gregorian calendar, which was used in the west. The days of 1 to 13 were simply omitted, and the month of February began on February 14. The First World War ended in 1918. Russia was transformed into chaos. On the one hand, groups of plunderers invaded peoples' houses and stole what they wanted. On the other, the government confiscated farmers' harvests to feed people in the cities and to export. On 3 January 1919 my father Adolf, son of Gustav and Rosalie Neumann was born in Granidub, Volhynia. The Russian Civil War ended at the end of 1920 with a communist victory. The Allies, who had helped the "White Army" had given up. In the beginning of 1921, Gustav decided to leave Granidub and to look for another place to live. The family moved initially to Janovka, some 10 miles distant, where they worked several months as caretakers of a school, attached to the Lutheran Church. Because of the chaotic situation in the country in 1921, Lenin reintroduced a more liberal economy. This allowed for more individual manufacture and commerce on a small scale. Peasants could again sell their harvests on the free market. With these changes in the economy, normalization returned to economic life. Therefore, Gustav and many others believed that the situation would be better. He learned of available lands in Catharinoslav (or Yekaterinoslav, called Dnepropetrovsk after 1926). Mennonite farmers were leaving the country and offering their properties, fully equipped, at low prices. Gustav decided then to move to there and purchase a farm. Catharinoslav was located on the left bank of the Dniepr River, to the south of Kiev and not very far from the Black Sea. Arriving in Catharinoslav, Gustav found a suitable farm and decided to buy it. The family settled in and started to work. In the Catharinoslav region, it was customary for farmers to group together in small villages, where they cultivated their fields a few miles away. The village consisted primarily of a long wide main street. On each side of the street were plots of land which contained the house, the flower garden, the vegetable garden and the orchard. Also there were quarters for employees, stables for the animals, silos, sheds and several machines. Since they did not have electricity, they used windmills and animals for power. The houses in which they lived were very substantial. They were two story houses with very thick walls to protect them from the cold of the severe winters. In the houses were great brick fireplaces covered with tile for heating. For lighting, kerosene lanterns were used. On the roofs, it was customary to install a wagon wheel, which served as a nesting base for storks. Gustav installed in the cellar a small camouflaged vodka factory; this was forbidden by the government, because of the scarcity of wheat grain. To the rear of the plot of land stood a small forest. Beyond the forest lay a cemetery, where the dead from disease, epidemic, war and revolution lay buried together in a common grave with a large mound of earth. So many people had died that they did not have time for individual burial. Marriages, at the time, were arranged by parents. Gustav chose Rudolf Wichmann to be the husband of his daughter Herta. Rudolf Wichmann was born 22 September 1897 in Granidub. They married 5 May 1923 and the wedding celebration lasted several days, and with much vodka. As a marriage dowery, Herta received a trousseau and some animals. Rudolf acquired a piece of property in the same village, next to Gustav's farm. Lenin died in January 1924. A great power struggle ensued in the government of Russia. Baby Elfriede Wichmann was born on 17 October 1926 to parents Rudolf and Herta Wichmann. During 1925 and 1926 land redistribution by the communist government reached the Catharinoslav region. Farmers were being forced to give up their land without compensation. The confiscated farms were being divided up into plots of approximately 25 to 40 acres and given without charge to those "without land". The Neumann family were eating lunch one day, after a hard morning's work on the farm and discussed with alarm the confiscation of lands. Suddenly seven armed policemen invaded the house with bayonets and pulled Gustav out of the house, slapping him around and knocking him to the ground. After eating the food on the table, they lit torches and set fire to the storage room, where one hundred bags of wheat were stored. After several threats, they left. It was the first warning and the beginning of several attacks. Gustav did not escape the land confiscation. Only the piece of land with the house where they lived was spared. Now survival came to depend almost entirely on the clandestine vodka distillery. The marriage of daughter Erna was also arranged by Gustav. The chosen man was Leonhard Frenzel, who came with a mediator and a bottle of vodka. This match-maker would negotiate the marriage. Leonhard Frenzel had been born in Neumanovka in Volhynia on 2 May 1895. The marriage was performed in 1926. Because the economic situation was difficult at the time, the wedding party was modest and they did not receive an endowment (dowery). After the wedding, Leonhard and Erna moved to Priamur, located beyond the Baikal Mountains near Kharbarovsk. Here Leonard bought land in a new colony that was developing in the region. In 1927 Josef Stalin gained control of the government. He worked ruthlessly to eliminate any opposition to him and to impose total control over the people. He ended freedom to travel; everything was controlled. He instituted a great structure for repression in which everyone informed on each other. Thus, children denounced their parents; neighbors exposed other neighbors; wives turned against their husbands; and husbands turned against their wives. The threat of being put in prison was real and constant. It could happen at any time and under insignificant ridiculous accusation. People were sent to the fields of forced labor. The communists wanted to transform the country into a great power, at the expense of the enslaved workers. In 1928, the government organized a great economic plan, called the Quinquennial (Five Year) Plan. This emphasized rapid development in heavy industry and collective farming. Inhabitants of cities received ration cards for food. If a person did not have a ration card, he did not receive food. With these forms, the communists had the power of life and death over the people. Adolf, accompanying his father Gustav on a trip to Kiev, saw enormous lines of hungry people in a sad state, waiting to receive food with ration cards. Food was scarce, so the peasants did not feel motivated to be productive. As a result, thousands of people died of hunger. As everything belonged to everybody, and nothing belonged to anybody, carelessness and disinterest took hold, and things were simply left to fall to pieces. On 14 April 1929, son Erwin was born to Rudolf and Herta Wichmann. The Neumann and Wichmann families, which had already been reached by the confiscation and redistribution of land, were still living on the plot of land in Catharinoslav. But the situation was no longer viable. The high taxes imposed by the government, the prohibitions of service in the churches, and the frequent harassment and arrest threats by the police had made Gustav see that they could no longer continue to live there. Also the formation of collective farms were already being established in the region. They did not know what to make of it. Some families had already been forced onto collective farms. No one knew who would be next. The Russian borders were closed with barbed wire; guards tried to prevent people from escaping. If communism was so good, like they said, why were people running away in despair, abandoning everything? Where was it possible to cross the border? Going down the Dnieper River to the Black Sea was not so far, but all the ports were controlled and sealed off. Even to withdraw money from the bank was impractical, because everything was watched. They needed to concern themselves with the money that was kept in the house. It was the beginning of December 1930; a great sadness prevailed. It had already been said many times that it was necessary to flee the country; but now the moment had come. How hard it was to gather some things to take along and to abandon the remaining possessions. It all seemed like a huge nightmare. It was a terribly cold day; and the fingers were frozen by the wind and snow. During the night Gustav hitched two horses to the wagon; Rosalie and the children helped to load it. The same was done by Rudolf and Herta Wichmann, along with their children Elfriede and Erwin. Erwin was only one year and eight months old. In the haste that the situation demanded, only the bare essentials were taken: clothes, blankets, pillows, documents, photos, some dishes, food and many bottles of vodka. Rosalie remembered to take along a bag of sugar cubes to help fend off hunger, in case they were unable to obtain food on the trip. They took along all the money kept in the house. They had to abandon the house with its improvements, furniture, utensils and everything. The farm was left behind, cattle in the corral, crops in the field, machines and other animals. With heavy hearts and tears in their eyes, they bade their home, which was so dear to them, one last goodbye. Still they wanted to take one last glimpse of that small village, where they had lived a long time, where the children had been born and had grown, and where they had lived with friends and relatives. Everything that they had gained, with much sacrifice, now had to be left behind. There was no other solution; no one wanted to fall into the hands of the Bolsheviks. The destination was Moscow. The Wichmann family followed in a separate wagon. Before dawn they had left from the village area. They were going up a hill when the first rays of sun appeared on the horizon. From there they were able to catch one last glimpse of the village that they forever left behind. It was very difficult to hold back the tears. They knew that the long trip would be difficult and dangerous, but they entrusted their destiny to God. They followed the road from village to village. They found many nearly abandoned houses, where men readied the horses as women prepared meals with what they could find. With overloaded wagons, they advanced slowly. At some rivers, there were narrow wooden bridges, which fortunately supported the weight of the wagons. The trip was hard; the road was full of rocks and ruts. After some rainy days, everything was muddy and slippery. They were soaked through with rain and dirty from the mud. Some days it was difficult to find food and shelter for the horses. It was necessary for someone to spend the night in the wagon so that the horses were not stolen. Depending on the weather and the road conditions, they advanced some 20 to 30 miles (30-50 km) each day. When they arrived in Moscow, Gustav inquired carefully to learn where they could cross the border. Unrelenting care was required so as not to arouse suspicion; not to profess the communist doctrine was considered a heinous crime. Gustav used his knowledge of Russians' proclivity for vodka to get them drunk to get the information that he needed. The only place where it was still possible to cross the border was at far off Vladivostok in Siberia. There, only in winter, escape could be made by crossing the frozen river on foot, to China. Gustav purchased tickets at the railroad station. They transferred their possessions from the wagon to the train and climbed aboard. The horses and wagon were abandoned at the station; it had no identification on it, so the owner could not be traced and identified. On the trip, they passed the Volga River and the city of Orenburg, They crossed the white Ural Mountains constituted mainly of marble and calcareous rock, with no tunnels. They passed Omsk and Tomsk. They arrived in Novosibirsk, where they had to change trains. The next stop was Irkutsk, near Lake Baikal and before the Baikal Mountains. On some days they stopped to wait for the next train on the other side of the river. They crossed the Baikal Mountains, a rocky formation, with more than 50 tunnels. They arrived in Tchita, where the railroad tracks divided. One route passed into China, but it was not possible for them to cross the border there. They had to take the other route. After the mountains they came to Priamur. Priamur was the new colony where Erna Neumann and Leonhard Frenzel had settled after their wedding. Leonard Frenzel did not want to follow the Neumann family in their escape to China. Therefore, besides this difference with the father in law, Leonard said that he wanted to decide some things with his friend named Pastochenko. Also, he would not allow Erna to follow with her parents; so under threat of denouncement, Erna gave up. The Neumann and Wichmann families continued on to Kharbarovsk. There the train changed direction to the south and continued to the last station, Vladivostok. Near Vladivostok, they occupied an abandoned house, totally furnished and some distance from the city. The house, with no heat, was frozen. There were layers of snow on the furniture. Icicles hung in the house like stalactites in a cavern. Around he house was a field, where many wolves howled mournfully. Beyond the field was a dark forest; the wolves would not risk entering there because of the bears. Gustav arranged for a job in the home of a family to earn money and food. He cautiously inquired about where to cross the border. He discovered another fully furnished house closer to the border, between Slawjanka and Kraskino. They moved in there. Always using the vodka as a bribe, Gustav talked with people and arranged for guides to help in the crossing of the border. The escape had to be made in the middle of the night because of the border policing. Crossing the Border into China. The fugitives had acquired sleighs and fastened onto them clothes, food and goose down filled comforters, as best they could. The sleighs were pulled on foot through the snow. The contracted guides were 15 or 16 year old youngsters. They were royally paid and demanded their money in advance. They left on foot in the middle of the night and by the following day at dusk, they arrived at the border of China. It was horribly cold. The guides always ran ahead; and the group followed in their footprints in the snow. If someone could not keep up, because of fatigue, he stopped and had to stay back. Near the border there were accumulated snow mounds. The refugees would hide behind these mounds, as they waited for the police to pass. The police patrolled in pairs, armed with rifles and bayonets and ready to shoot. After the border police passed by and moved on, the refugees had to run hard, pulling their sleighs. They had crossed the frozen river and had reached the Chinese side of the river. As soon as they had crossed the border, the guides disappeared. They were finally free of the communist "paradise". On the Chinese side they continued to walk. Initially they found only farms. A few miles after crossing the Chinese border, the group of travelers were intercepted by the Chinese police, armed with rifles with bayonets. They ordered the group to line up next to one another. Rudolf turned to Herta and said, "Herta, this is the end of us." But Herta answered, "No, God has helped us and has miraculously brought us this far. We have survived many tribulations, He will help us and rescue us from the hands of these men now." Upon hearing this, Rudolf lowered his head and did not say anything more. When the police raised their rifles and prepared to shoot them, the children began to shout and cry. When the police heard the shouts and crying of the children, they felt sorry for them and lowered their weapons. They said in Chinese, "suba, suba" that means '"go away, go away". And so, miraculously, they had escaped death. After they had escaped from the Chinese police, they had the problem of finding a place to stay overnight and of finding food to eat, in the houses that they encountered along the road. At some places, they received food and a place to wash up and to sleep. At all of the houses where they were welcomed, the people had heating. The beds were made of bricks, under which was a hollow area where fires were built to keep them warm. They walked on foot until they reached the first train station inside of China. According to the map, it seems to have been Onsong. There they were received in a hotel, whose owner was a Russian. The immediate problem was how to get to the city of Harbin, if they had no money to buy tickets on the railroad? One member of the group had an idea. He went to the station and asked for information about how to send some cargo to Harbin. The man at the station explained which train, the time schedule and from which station it would depart. When the train arrived, one of the group went to the station and looked for an empty car; the entire group climbed aboard and made themselves comfortable. The train departed. When the train arrived at the indicated station, they opened the gate and carefully jumped outside so as not to be seen. The same thing was done at other stations, always looking for an empty car in which to hide the group. In this manner, they were able to arrive in Harbin. During the trip they encountered more and more fugitives from communism, more fellows of misfortune. All helped one another, as much as they could be helped. At one station, when they needed to change trains, one of the group members came running to tell them that he had found a car with a pile of straw on one side. It was straw that had been used to pack bottles of wine. He said, "Tonight we will not have to suffer the cold." They climbed aboard in this car and during the night, pushed the straw to the middle of the car and set it afire. Nobody had realized that Chinese railroad car floors were made of wood, not steel. Their only chance to escape was to jump out of the burning railroad car. They walked on foot until they found a house. It was a Russian family, who took them in and let them spend the night. On the following day they continued the trek on foot, until they reached the next train station. When they arrived in Harbin, near the end of February or at the beginning of March 1931, they had to seek a shelter. They knew that a shelter for refugees had been established; it was called "Obsigitie" in Russian. They found that it had an enormous piece of land, encircled by walls. In the middle was a great courtyard. Around the courtyard stood one room brick structures attached to one another. Each had a door and a window. Each one of these one roomed structures had many beds in it. To the front of the large plot of land stood a large house with three floors; The rooms here also had beds for refugees. The construction was brick, with thick doors, to insulate from the cold. As more refugees arrived, they would join the two or three families in each housing unit. The adults worked; the children attended school. In school, the children were able to receive food to eat. The school was improvised on the ground floor of the large house; it was equipped with furniture and benches. There, Reinhold Holz, also a refugee from Russia, instructed the children in German. The women generally worked in family homes and had time off usually on Sunday afternoons. The men worked in construction, gardening, or as caretakers for the obsigitie, etc. In 1931 the Japanese attacked Harbin with airplanes and bombs. The people heard what sounded like thunder; the bombs made the earth shudder. The Chinese soldiers had downed one airplane. Several curious refugees approached the downed airplane; it exploded and killed several of them. The city of Harbin was full of Japanese soldiers, who occupied one quarter of the city, near where the Russian refugees lived. Several of the refugees searched around looking for weapons and ammunition that got dispersed during the Japanese attack. The Japanese were offering reward money for the return of this material. One refugee, named Lange, was killed while searching for war material; he stepped on a bomb and it exploded. The life of a Russian refugee was difficult and dangerous in Harbin, China in 1931. The fate of the Frenzel family. Shortly after the Neumann and Wichmann families departed from Priamur when Leonard did not want to accompany them, the police invaded the Frenzel home and forced them to submit to a torture session. The soldiers ordered Erna to run and they took shots that landed close to her feet. Leonard was struck and knocked down in the mud. Leonard and several other men were imprisoned. Leonard was condemned to die by a firing squad. Erna, son Edward age 11 months, and her father-in-law, and many other people were loaded on a freight train and sent to work on a collective farm in Siberia. The train, normally used to haul cattle, was dirty, cold, uncomfortable and overcrowded with people - both adults and children. It was winter; many died during the trip from cold and hunger. The escape of Leonhard Frenzel. In prison, Leonhard was assigned to work in the carpenter shop, together with a friend named Pastochenko. They made plans together to escape. One day at the end of work, they hid themselves in sawdust. After all the others had left the building, they broke out a small window and climbed through it. Leonhard suffered cuts on the fingers of his right hand. They jumped the wall, using a long jumping rod and ran away into the weeds. They were pursued by guards and dogs, but they miraculously escaped. They heard the barking of the dogs from afar. From there the two walked for several days to the next village where Leonhard had two fingers of his right hand amputated because of the risk of gangrene. From there they followed the train tracks until they came to a train station. Here they climbed aboard with the destination of Vladivostok. Here they, too, crossed the border into China, with the help of paid guides. Finally, they too, arrived in Harbin and reported in to the refugee shelter on 14 December 1931. The train, on which Erna, son Edward, father-in-law and others traveled to Siberia was very cold. The trip lasted many days. They were hungry and dirty, and they did not even receive water to wash their faces. From time to time they received only a piece of dry bread and a little water to drink. Erna's father-in-law did not survive the cold and hunger. He died one dawn on his knees praying. On the following morning the guards threw him out of the train into the snow. Baby Edward of 11 months tried in vain to nurse the breast of his unfed mother and was fainting and getting cold in Erna's arms. In order to keep the guards from throwing his tiny body off of the train, she held him close to her body as if he were nursing. She wanted to at least give her baby son a decent burial. From the train station to the collective farm, the group was taken by wagon. Upon arriving at the farm, Erna buried her infant son. She had held the frozen baby against her body for many days, and she had almost died of pneumonia. Each family received as housing, one room in the large house of the collective farm. Since Erna was alone, a family of Germans invited her to live with them. The women and children were forced to work in the fields of the collective farm. The day started before dawn and always ended after dark. The manager there took note of everything. He distributed daily rations according to the amount of production of each person. The controlling man (foreman) was assigned to the work organization, because of his fanaticism and dedication to the communist party and his ruthless capacity to force peasants to work. Erna's escape from the collective farm in Siberia. Erna was at the forced labor collective farm from December 1930 until the beginning of 1932, when finally she was able to run away. She took along some clothes and a little food and escaped through a window in the night, while the others slept. She slipped through the barbed wire fence and walked until she reached the train station. She climbed aboard the train and rode to Priamur. There she looked for her husband, but she did not find him. At the post office there was a letter from Erna's mother, who was now in China. She did not know what had happened to Erna. Ready to resist bravely and to see the family again, Erna boarded the train for Vladivostok. At Vladivostok she worked in a house for a family while she looked for a way to cross the border into China. Like her parents, Erna crossed the frozen River on foot, helped by paid guides. In China, Erna found a merchant named Ickert, who owned a store in Harbin. He regularly made deliveries between Harbin and the Russian border. He gave Erna a ride, because she could walk no further. On his wagon, filled with large empty whitewash barrels, Erna hid in one of them. Thus she secured transportation for a great distance. When she left the large barrel, she was totally covered with whitewash; and she looked like a ghost. Erna finally reached Harbin about March or April 1932. She was walking in the street, looking for a place to stay, when she suddenly saw her father. It was a scene that was impossible to describe. He took Erna home to the family members, and the reunion was like a great party. Conditions in Harbin in 1932. The number of refugees increased daily. Pastor Kastler of the Lutheran Church in Harbin appealed to the president of the Committee of the Worldwide Lutheran Convention, Dr. John A. Morehead, to assist in finding a solution to the problem. The situation had become desperate, and the Chinese government wanted to return refugees to their native country. Dr. Morehead was totally consumed in the task of obtaining funds, ship passage and a country which would accept the group. THE HARBIN, CHINA LUTHERAN REFUGEES. The Evangelical Lutheran Church of Manchuria in Harbin issued a document on 23 April 1932 entitled, "Brethren in Need". It certified that Gustav, Rosalie, Ewald and Adolf Neumann were on the list of travelers to Brazil. A similar document was issued for Leonhard and Erna Frenzel on the same date. With these documents in hand, the Neumann and Frenzel families, together with other refugees, boarded a train in Harbin. This was at 9:45 p.m. on 2 May 1932. On the following morning at 7:20, they changed to another train at Chang-Chun. They traveled by train until they reached Liu-chin (Port Arthur) on the Gulf of Liao-Tung, where they boarded a Japanese ship to cross the Yellow Sea to the port city of Yen-tai. The Japanese ship was small, and the refugees were crowded together like "sardines in a can". Sanitary conditions were lacking. In the port of Yen-tai, they boarded a train for the port city of Shanghai. On 7 May 1932, they embarked on the ship Porthos. There were 83 family groups of refugees. A person traveling alone was included in a family as an adoptive son/daughter (Pflegesohn/Pflegetochter). In the case of Gustav, two young men were assigned to his responsibility: Erich Drude, 19 years old, and Jonatan Wotzke, 33 years old. Leaving Shanghai, the ship passed through the Straits of Formosa and stopped in Hong Kong. They continued through the China Sea and stopped in Saigon, Vietnam, and Singapore. They crossed the Indian Ocean, the Arabian Sea and the Red Sea. They passed through the Suez Canal and the Mediterranean Sea to Marseilles, France, where they arrived on 11 June 1932. From Marseilles they traveled by train to the Atlantic port city of Bordeaux. 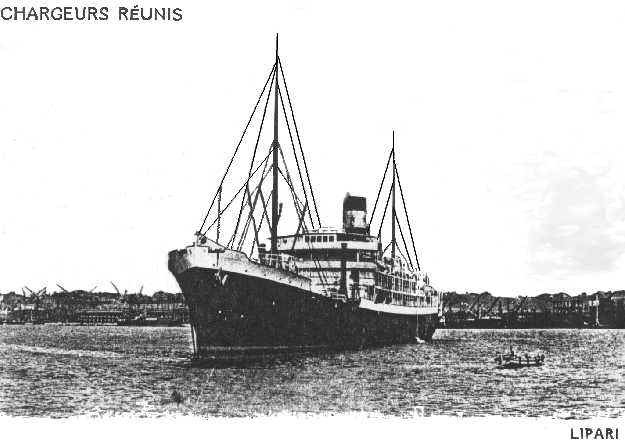 There, on 12 June 1932, they embarked on the French ship Lipari, operated by the Chargeurs Réunis Company. Upon arrival in Rio de Janeiro, Brazil, they received an arrival stamp showing 28 June 1932. They were housed for eight days on the Island of Flowers (Ilha das Flores) in Rio De Janeiro. The Rudolf Wichmann family had been held back. Finally on 15 March 1934, the German consulate in Harbin issued a special passport so that Rudolf, Herta, Elfriede and Erwin Wichmann could emigrate to Brazil. On 6 April 1934 they received an exit visa stamp from the Consulate General of Brazil in Shanghai. They boarded a ship with the destination of France. The ship was the S.S. Dairen Maru of the D.K.K. Dairen-Tsingtao-Shanghai Line. On 30 May 1934, they disembarked in Rio de Janeiro, Brazil. From Rio De Janeiro to Santa Catarina. In Rio de Janeiro on 7 July 1932, the immigrants who embarked on a Brazilian ship with a destination of Porto Alegre, in the state of Rio Grande do Sul. From Porto Alegre they continued by train to the city Irai. There they crossed the Uruguay River on a raft. On the other side of the river they were temporarily housed until their farms could be surveyed and marked off. The Neumann and Frenzel families received plots of land next to one another in Maracuja. This was near the Iracema River and some 20 miles from the Uruguay River. Each family also received clothes, blankets, kitchenware, seeds, tools, a canvas, a firewood stove, and some money to be paid on installments until the planting and harvesting of crops could be done. Since there were no houses on the land, they had to live initially out in the open under large leafy trees. For three months, while they were constructing a hut, they slept on a bamboo mat suspended between the branches of the trees. When it rained, they lowered the canvas sides. To get up into the tree, they had nailed branches to the trunk, which served as stairs. Erna explained that below the improvised bed, she had found a nest of snakes. Down on the ground, they had improvised a kitchen. Monkeys, who lived nearby, always showed up to steal food. Also, before long, some "bugres" (aboriginal people) raided the camp, destroyed most everything and stole kitchenware and other objects. They constructed a hut out of branches, and they covered it with straw. A wooden rustic shed served as a church. They cut down a great tree and felled it across the Iracema River; this served as a bridge. Each family was required to donate one week of work in the building and maintenance of a small roadway for access to the farms. The roadway needed to be big enough only for the passage of one horse. For being virgin forest, all types of insects lived there. Mosquitoes, poisonous spiders the size of a hand and snakes lived everywhere. At dusk, near the river, snakes were stacked all over one another on the still warm rocks. If someone needed to get water after dark, they carried sticks of wood along to protect themselves from the snakes. One time Ewald was sleeping when Adolf suddenly saw a jararaca snake slithering down from the ceiling of the hut. Adolf cried out; and Ewald sat up immediately. The snake fell exactly where Ewald had been lying seconds before. He had barely escaped. Life on the farm was difficult; the work was hard. Gustav took two harvested bags of maiz to the city Irai on horseback, to exchange for other provisions. However, the cost of the river ferry to cross the river cost half of the maize. On another occasion, Gustav went to the village to sell eggs, but nobody wanted to buy eggs. They had their own hens who laid eggs. After approximately a year of more or less permanence in one place, Gustav concluded that they did not have favorable enough conditions to continue living there. The farmers worked hard to raise their crops, but when they sold them, they received almost nothing. Yet they had to pay a lot of money for anything that they needed to purchase. So hey collected their belongings, abandoned their farms and moved to the city Ijui. Many others had done the same thing. After Ijui, they moved to Porto Alegre, the capital city of the state of Rio Grande do Sul. Greater opportunities for prosperity lay there. Deciding to move to Porto Alegre proved to be good progress. Not all of the German families were able to escape from Russia in time. Some of the Neumann relatives remained in the Ukraine. They corresponded, and in some letters, they told of the terrifying confiscation of foodstuffs. "They were starving us to death." The last letter that they were able to send was in 1932; it was a cry of desperation, "We do not have anything more to eat; they have taken our last cow." The contact ceased; only silence remained. Had any of the relatives survived? To this day we do not know the answer. What occurred in the Ukraine was genocide, planned by Stalin in 1932-33. He decided to respond with terror to the resistance that farmers offered against moving to collective farms. The communists confiscated all of the foodstuffs; the army troops closed all of the roads and railway lines. Nothing and no one was allowed to enter or leave from there. Stalin sent his fanatical servant Lazar Kaganovitch to crush the last resistance of the farmers. Kaganovitch was one of the most ruthless Soviet murderers of Stalin's many killers. People ate their pets, grass, pork rind, tree bark and tree roots. When these things were gone, people starved. Many colonies disappeared. So people died of hunger, and nothing remained, only ruins. Every day communists arrived with wagons. They collected people who had fallen on the ground. Some were dead; others were not. They were all put in a mass grave. The holocaust in the Ukraine that eliminated approximately nine million people during 1932 - 1933 is not well known by a lot of people in the outside world. Millions were exterminated by Stalin and his murderers; they were never prosecuted. None of the Soviet assassins that made the monumental holocaust had been judged. Lazar Kagonovitch lived in Moscow with a generous retirement from the state died some years ago. The leftists, with their Marxist theology, have their ideological and historical roots interlaced with these terrible crimes that were Stalin's mass exterminations. Martyred and murdered in the Soviet Union from 1917 until 1991, when communism finally fell, some 120 million people died unnecessarily. These numbers have been confirmed by Alexander Solzhenitsyn and other historians. I believe that adequate words do not exist in any language, to express the agony experienced and endured by those people who had to abandon everything and run away in the middle of the night. They had to escape the terror of communist enslavement that devastated and destroyed a majestic country, Russia. My grandparents remembered their homeland from which they had left in such sadness. My grandmother cried very often when thinking of it. In his later years of life, my grandfather rambled around in the yard going from one side to the other. He stood sadly staring at the horizon, silenced. It seemed as if he wanted to bring close to himself the reminiscences of the places where he had been born and where he grew up. He thought of his home, which he was forced to abandon in such an unfair manner. Homesickness. There remained only the remembrances of a place that he would never see again. With the courage and determination of my grandparents in leaving everything behind and facing great danger and an unknown future, they did not know if they will come through with their lives or not. They gave the gift of freedom and the possibility of having a better life to their descendents. We hope to God that in Brazil, that nothing would ever happen like that and that the resolve and vote of confidence that they put into this country which took them in, has not been in vain. "The Lord had done great things for us; whereof we are glad." Psalm 12l6:3. Written in Portuguese and translated into English by Erica Margita Neumann. Porto Alegre, Brazil.